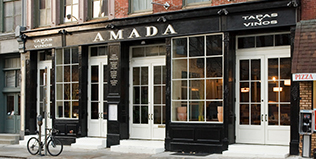 Amada is located at 217-219 Chestnut Street, in Philadelphia’s historic Old City neighborhood, steps from public transportation and easily accessible on foot or by car. Keep right at the fork, then turn right onto North New Street. Take the next right, onto North 4th Street. Continue four blocks, then turn left onto Chestnut Street. In 1 ½ blocks, Amada will be on your left. In 1.6 miles, exit at I-676 East / US-30 East towards the Ben Franklin Bridge. In .2 miles, merge onto I-676 / North 6th Street and continue to follow North 6th Street. In 3 ½ blocks, Amada will be on your left. From Public Transportation Amada is located one block south and ½ block west of the 2nd Street stop on the Market-Frankford line. ADA Entrance Our ADA entrance is located to the side of the restaurant, on Strawberry Street. Please use the buzzer to alert our staff of your arrival and any assistance you may need. You can also visit http://philapark.org/locator/ and enter our address, 217-219 Chestnut Street, Philadelphia PA 19106. Hungry For More From Chef Garces? Sign up to receive exclusive email announcements about special events and offers from Amada.